You'll be £5.20 closer to your next £10.00 credit when you purchase The History of Newgate Prison. What's this? As the place where prisoners, male and female, awaited trial, execution or transportation, Newgate was Britains most feared gaol for over 700 years. It probably best known today from the novels of Charles Dickens including Barnaby Rudge and Great Expectations. But there is much is more to Newgate than nineteenth-century notoriety. In the seventeenth century it saw the exploits of legendary escaper and thief Jack Sheppard. Author Daniel Defoe who was imprisoned there for seditious libel, playwright Ben Jonson for murder, the Captain Kidd for piracy were among its most famous inmates. This book takes you from the gaols twelfth-century beginnings to its final closure in 1904 and looks at daily life, developments in the treatment of prisoners from the use of torture to penal reform as well as major events in its history. An easy to read introduction to the culture of a London prison prior to reform. We think of prisons mostly as public institutions of incarceration, but Newgate was privately run and those imprisoned there had to pay for the “privilege” of entering, leaving, and residing within its walls. Jowett provides vivid descriptions, sometimes in her own words and sometimes in those of people who experienced it. By book’s end it’s easy to understand why this long-gone prison remains an indelible memory of times past. One may also comprehend why some chose to follow the short, but merry, life of a pirate instead of living within. When the back cover closes, readers will be thankful they were never “treated” to the experience of being a Newgate inmate. 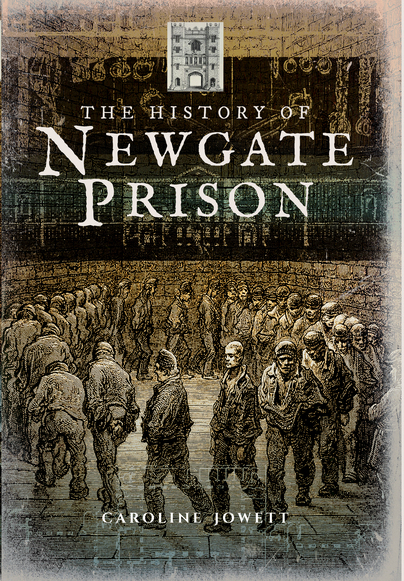 Exactly what the title suggests – a history of Newgate Prison. Meticulously researched, written in an accessible and readable way, full of historical detail with the occasional anecdote to enliven the narrative, it’s exactly what a good history book should be and it’s both interesting and illuminating about crime and punishment in England over the centuries. This is a highly readable and accessible account, not only of the iconic institution, but also of the history of crime and punishment. It is packed full of evocative detail and is essential reading for all those interested in crime history. Caroline Jowett describes one of the most famous and at the same time most infamous of Britain's jails, from the 1100s to 1904, when it was finally decommissioned. An amazing, entertaining and informative book! What a book! For a history lover, it is a great read. For a lover of British History, it is an even better read. I read this in two days, and could not put it down. The research and the time that Caroline Jowett put into this book is evident. I was enthralled from the first sentence. The hundreds of years of lives in that prison, along with the filth, disease, lice (yuc!...especially reading about a prisoner who bit them in half and threw their bloody little bodies against the wall...ugh)....is shocking and disgusting..but nevertheless, intriguing. So many well known authors spent time in Newgate prison..and then there's "The Beggar's Opera"!, set in Newgate which was said to "Make the Rich very Gay and the Gay very rich". I'm sure their interpretation of Gay is not what ours is today!Thank you to Pen and Sword Publishing for the PDF Galley. I feel like I just spent time in a wonderful history class, which gave me the opportunity of learning a great deal of Historic information. I enjoyed reading it, I had known about Newgate from the various history books I've read. However, I had never know more than the basics of it and the prisoners confined in it. I think this is a good book for a starting point on wanting to know more about criminal history in London. I found it very informative, interesting, plenty of great information. The book is great for students if it's necessary a research, but also for all the people in love for History. It's an easy read and also enlightening. This was a very well-researched and very well-written look at the history of one of the world's most infamous prisons. This is a must read for anyone interested in the history of crime and punishment. This book is also a great reference point for reading any English literature, such as Dickens, who frequently uses gaols and criminality in his works. I am a huge lover of historical non fiction and true crime so obviously this book was just made for me! I thought that it was a well researched book that was told informally enough to make it an interesting read and you weren't drowned in footnotes, quotes and historical references. It covered a long period of time and also featured famous people that have spend time within Newgate Prison. Thoroughly enjoyable read. This book provides a thorough and detailed look at the prison and the things that went on behind the walls. It also shows which books this prison was used in or which literary authors based some of their settings in their novels on Newgate. I enjoyed the information. It was fascinating to know that the prison had originally been built in the 12th century and to learn a little bit about the landscape of London throughout the centuries. It was also interesting to read about what types of punishment were considered appropriate as time went on, as well as to read about the beginnings of prison reform. I also found it interesting that such famous names as Daniel Defoe, Casanova, and William Wallace were inmates. This is a very enlightening and well researched book. It starts in medieval times and ends with it being pulled down. There are articles about famous people, as well as events that developed as time went on. The sometimes horrific punishments and sometimes for sins that you would never realise was a crime. I was shocked that debt was an imprisonable crime? This is a fantastic book and would recommend to anyone who either loves history and true crime. An excellent starting point for someone with an interest in historical crime and punishment. Newgate jail is known for its cruelty and unhealthy conditions that could kill the confined before they even got to court. Through the research of the author there was also found compassion. Interesting facts about the penel system and people of England during the timeframe of the notorious jail. I found the book to be very interesting and informative without getting dry or academic in tone. Overall, I'd recommend this book to those interested in learning more about the goal/prison system in England during this time period. A great insight to life inside prison life throughout history. I find the treatment of poor prisoners unbelievable. It is very interesting that there was a taproom and that families would move in together to save on rent. I am saddened that the prison is no longer standing because it would be a great teaching tool. Caroline Jowett is a journalist and former Arts and Literary Editor of the Daily Express where she has written about everything from badgers to ballet, etiquette to Italy. Shes been a fan of the eighteenth century since discovering the work of Jane Austen and Georgette Heyer and loves the periods sheer exuberance for life. She later discovered that the complexity of its history is even more beguiling than the fiction of its novels. When not writing about the Georgians she is working on a novel of her own.